I think I mentioned to you sometime last year that Cliff is now out in Las Vegas. His nephew is managing the rink for the new owners. Donn has been coaching at a rink up in Morristown, NJ for seveal years now. If Kevin finds out anything about Steve or Fred, we'll let you know. Mike - you're memory is right on. Kevin is still skinny with blond hair, although age has thinned it out a little, lol. Kevin is now 50. If you look on our team's website (www.ffwdskating.com go into the website and look under "Team Coaches" and click on Kevin's thumbnail picture) you can see for yourself that Kevin looks pretty much the same. From the shots in the thumbnail, from both Indoor and Outdoor Nationals, you can see he is still the small, skinny guy. But he's still VERY fast. Did you know Cathy Morante? I know her son was a world class artistic skater. She is involved in speed now. She was down at our practice this morning with a couple of her skaters. Kevin skates for her outdoor team. Forgot to say, welcome to the forum! Now that you mention it, I think I do recall you saying that but it was a while ago...all the grey hairs are settling in you see!!! Thanks for the effort in helping me get in touch with some of my old buddys.. If you see Cathy Morante, you definitely have to mention the Kennedy family to her. Her kids & us grew up together at "Roll & Ice", which was a rink on Long Island that had an ice rink downstairs & a roller rink upstairs. Her kids, Chris, Fred & Diane, all skated with us in various combinations. Fred actually skated elementary dance with my sister Peggy. We spent a lot of time with the Morante's over the years. Thanks for another blast from the past. Ever able to get some contact detail for Cliff, Steve and/or Fred for me?? Before, We got the helmets !! "I LOVE JESUS" I Think it served him well.. I found legends around my part of GA.
kind of neat ...see how you can find..
thanks for the link, it was nice to see all of the CA peeps from the 70's. i thought everyone would like it as well.. I know i do everytime i look it up..
What have you been up to of late?? 1955-1958 Skated for Redondo Beach Speed Club. I live in Utah, I havent skated since 1966. 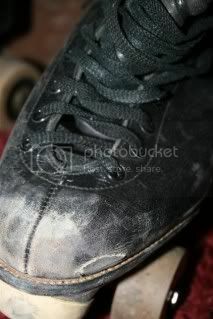 I skated with shoes I special ordered out of New Zealand made of kangaroo hide, and sure grip plates. Wooden wheels, cant remember the names now, but also specialty item. I skated mens relay in 1966 at the Nationals, 1956 Mixed relay, Out of Redondo Beach California and went to Nationals in Virgina, 1957 I went to Nationals and 1958 Mens relay and mixed at Nationals. ( I think it was in Ohio,, can't remember.) In 1966 I was on a men's relay team and also went to Nationals with Don Calvano and John Drewery and Buddy Carter,, you have a picture of our team on your forum.. Sorry to report that John Drewry, Grady Merrill, and Charles Wahlig have passed away. If you email me I can put you in touch with Charlene Drewry, Buddy Carter, Donn Calvano and Eddie Perales. I skated Mens and Mixed Relay with Donn in 61 at Nationals in Ft Worth Tx and , Mens Relay in 63 in Lincoln Neb., and in 64 Mens Relay again at Nationals in Louisville Ky. He and I formed up and ran C&L Speed Skating Ept., New Brunswick, NJ from 69-75 together. He runs his own Skate Distributorship still today back in NJ. Wow Bob I just read your post and got a chill. That is so cool that you found us. Everytime a true old school racer finds this site I get a big kick out of it. Welcome back. I know that Richard can get you in touch with some of your old friends. I will have to get in touch with Tony. You and he will know some of the same people from back in your days. 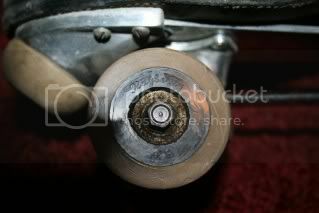 I skated in the 70's during the last days of wood and power racing. Send Racer an email and he can get you in touch with those guys. 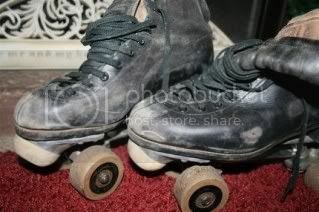 Here are a couple of pics of my skates.. I am excited to try to refurbish them now,, maybe even go a lap or two with these skinny old legs... lol Back in the day, John Drewrey called me GOLDEN LEGS... lol Ann Perales and John Drewrey are the God Parents to my daughter Kimberly... what great times we had..